In December 2008 a new book was released detailing the lifeboat station's glorious history much of it with full colour illustrations. Invited to write a similar book by the present lifeboat curator I had to decline because I was busy with my own Rohilla book, but I am glad that he found someone to compile a record of this busy lifeboat station. Whitby has a fine maritime heritage and the lifeboats have been there throughout its history. This new book Whitby Lifeboats: An Illustrated History makes for an ideal research source, as it has a wealth of information. It is well illustrated with many fine photographs from the author's own collection whilst many more are sourced from the lifeboat museum. The book looks in depth at some of the station's more memorable rescues. 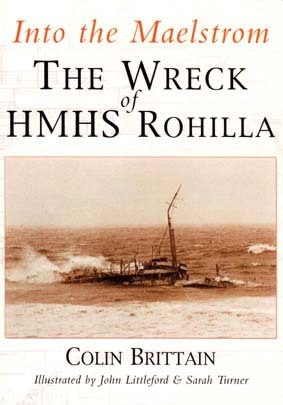 I have a profound interest in the wreck of the Rohilla and Nicholas has done a good job of including this rescue. He is without doubt an avid lifeboat enthusiast and this book complements his other books. Overall I would recommend this book to anyone with interest in Whitby Lifeboat Station. The book when released was £14.99, however as new second hand copies were readily available from only £7.65 with some book sellers selling them new for just £7.70, online at Amazon.co.uk. MONDAY marks the launch of a superb new book which charters the history of Whitby's lifeboat station. The busy station has a long and complicated history and is arguably one of the most famous in the country. Author Nicholas Leach has painstakingly put together a guide to the coxswains and crews who have a record of gallantry second to none. The book contains, for the first time in a single volume, a complete record of all of the Whitby lifeboats, from 1802 right up to the present day George and Mary Webb and OEM Stone III. Dramatic descriptions of the most epic rescues, such as that of the hospital ship Rohilla in 1914, are included, and all of the medal-winning services are given in-depth coverage. In fact, a whole chapter is devoted to the rescue from the hospital ship. A selection of superb colour images add to the impressive number of black and white historical images, many of which have never been published before. Many show the pulling lifeboats in action, and others cover the various motor lifeboats that have served the station. The most recent major event at the station, the opening of the impressive new lifeboat station and alongside berth in 2007, is fully covered, together with all of the many significant events in the station's past. These include the unique double naming of 1909 when both Whitby and Upgang lifeboats were christened at the same time. Written with the full co-operation of the Lifeboat Museum, the 208-page paperback book helps mark the museum's 50th anniversary this year. It also includes detailed appendices listing all of the lifeboats not just from Whitby, but from the neighbouring stations of Robin Hood's Bay and Upgang, together with comprehensive lists of the rescues. Pete Thomson, curator of Whitby Lifeboat Museum, said: "Nicholas Leach has stepped in to write a wonderful, comprehensive book which goes right from the station's beginning through to the present day." "It is a tremendous way to show the activities of the RNLI in Whitby and of course, it is a good way to raise money for the museum. It is a great thing to have." The book has been published by Landmark Publishing (log on to www.landmarkpublishing.co.uk for more details) and is available at The Whitby Bookshop and Holman's Bookshop, priced £14.99. Copies will be being signed by the author and crew on Monday afternoon at the lifeboat station for purchase by the public – call (01947) 606094 for more details. The lifeboat station at Whitby is one of the most famous in the country, and its Coxswains and crews have a record of gallantry second to none. This new book contains, for the first time in a single volume, a complete record of all of the Whitby lifeboats, from 1802 right up to 2008.Dramatic descriptions of the most epic rescues, such as that to the hospital ship Rohilla in 1914, are included, and all of the medal-winning services are given in-depth coverage. A selection of superb colour images showing the station's current lifeboat George and Mary Webb, and the inshore lifeboat OEM Stone II, add to the impressive number of black and white historical images, many of which have never been published before.The most recent major event at the station, the opening of the impressive new lifeboat station in 2007, is fully covered, together with all of the many major events in the station's past, such as the unique double naming of 1909, and the visits by the Duchess of Kent to name the station's new lifeboats. The book has been written with the full co-operation of the Lifeboat Museum, which celebrates its 50th anniversary during 2008, and the lifeboat station officials. During an internet search I located copies of the book on ebay for £9 and a number of used copies available on Amazon for just £7.